My default is not to throw things away. However, after eight years of accumulating items and moving with them from dorm room to dorm room and facing a self-financed cross country move, I finally realized that many of my material possessions were unnecessary burdens and not worth the time to pack or the money to ship. So before I moved for medical school I spent a lot of time going through my possessions and a fairly large amount of items were culled. Even though I won’t be moving again for about three more years, I’m trying to keep my volume of possessions relatively low. It’s nice having all the space I do and the only way to keep this space is to constantly edit what gets to stay. 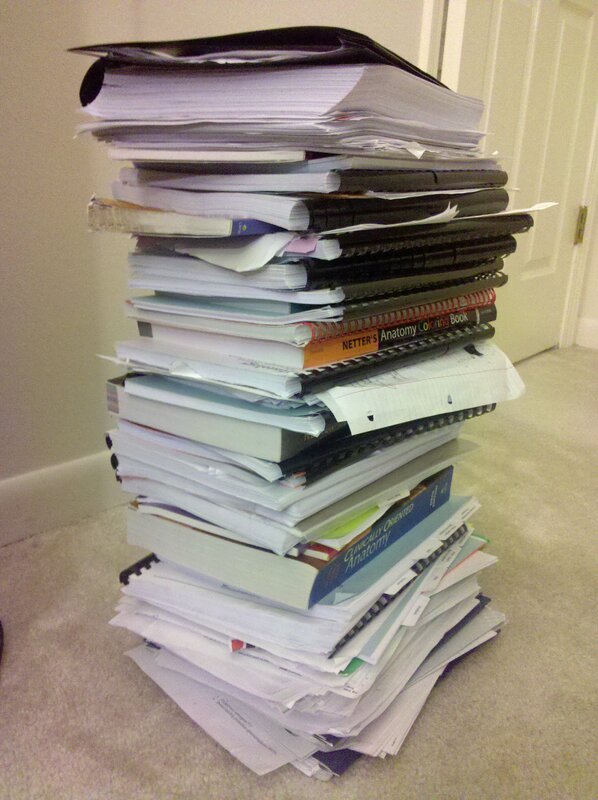 This precarious stack of printed materials is the majority of books and notes from my entire first year of med school. It’s about mid-thigh high. I opted out from receiving the printed powerpoint slides for many of the classes, and I either didn’t buy some of the textbooks, or have already sold them back, so this is quite a bit shorter than the stack a number of my classmates would have. I think the textbooks will get to back on my shelves, but a lot of the other material (like the course packets) I have duplicated as computer files, so I guess they’ll get recycled? I might let my tests stick around for a year or so, but I really doubt I’ll ever refer back to them. Maybe I’ll go ahead and recycle those now too. I’m dating a pack rat and living with one, so this isn’t easy. To be fair though, my boyfriend’s also working on letting go of things too, and we’ve been pretty good at not gifting items that generate/become clutter. It’s really freeing, taking pictures of things and then giving up the item. I’ll never be a “all my possessions fit in a backpack” person, but I hope to be the sort of person whose car fits in their garage, if I ever have a car and a garage that I would like to put said car in. well, i guess people do do that. -_-; if i ever get kitties, they will be spayed and what not. Hrm. 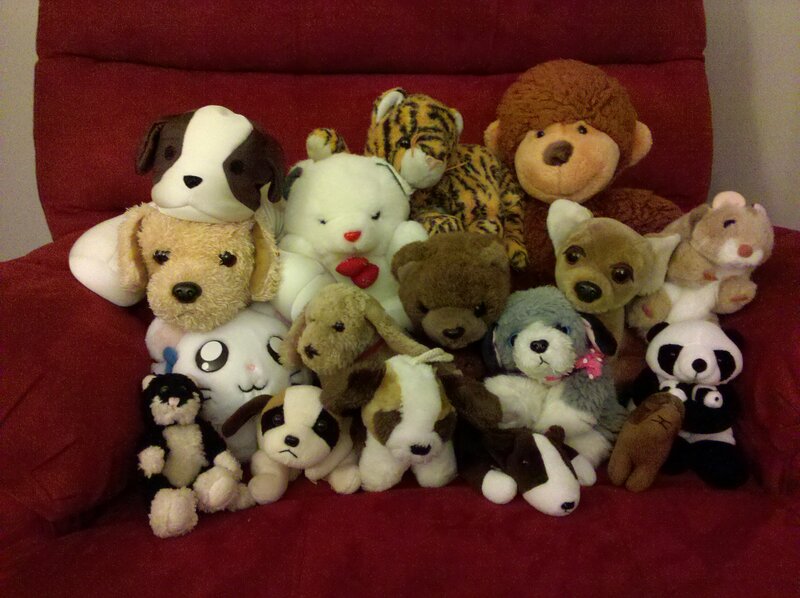 I find seeing stuffed animals as that almost sentient and worthy of …respect? consideration? vaguely disquieting, somehow (which I guess is how the idea of giving them away feels to you). I did have lots of real pets growing up, so stuffed animals were always very tangibly Not Real and not only that, but the live pets eventually die(d), so I’m very used to having to say goodbye, and that feels more natural and right. i think accidentally loosing stuffed animals is like a pet dying. i go through panic and try to find them phase, then accepting, and then sometimes replacing. Not having had a pet before is probably a factor, but also probably not the only reason. Some people just get more attached to things in general. I read once that ancient Indian scholars would commit entire passages of texts to memory because they didn’t think that having them on paper copies was a good safeguard. What I’m basically trying to say is: YOU’VE MEMORIZED ALL THE MATERIAL FOR YOUR FIRST YEAR CLASSES, RIGHT? I’m kind of wondering whether I should do something like this soon. I do have some stuff that I think would benefit from being donated, although after watching Toy Story, I get really sad about giving away my stuff. I’ve never seen any of the Toy Story movies. Way to spoil the plot! (I’ve seen the trailers though so that was totally not a spoiler). I was really happy when I first came across that idea. All these school shirts rarely fit me anyway! They never order them small enough and even when they do, they never order enough of the smaller ones. REMEMBER, we have a SEWING MACHINE in our apt! 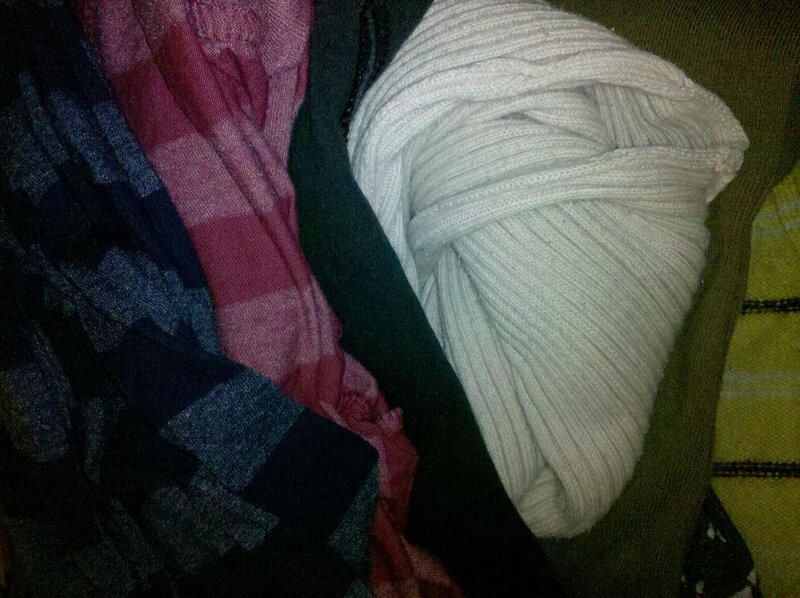 :D under my piles and piles of artsy stuff in my room…. Yup. If I get around to making my t-shirt quilt before I’m done with med school, I’ll be using your sewing machine.